"This is a stepped drum machine. The designer was Hugo Bunzel, a calligraphy teacher and former painter in Prague. 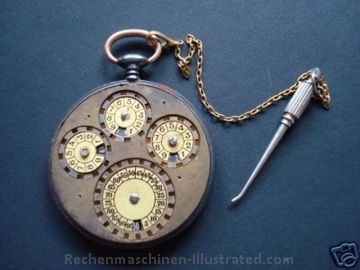 The manufacturer was the Bunzel-Delton-Werk Fabrik automatischer Schreib- und Rechenmaschinen, Favoritenstrasse 194, Wien X. The machine was supplied with one and two result mechanisms, with and without tens-carry in the revolution counter, and with additional stepped drums. In some machines one could switch from addition-multiplication to subtraction-division by reversing the direction of the crank. A number of different sizes were available. Factories were set up in Austria, Germany, Italy, and France, although the number of units sold was never large. At the end of 1915. production was stopped because of the death of the factory owner. 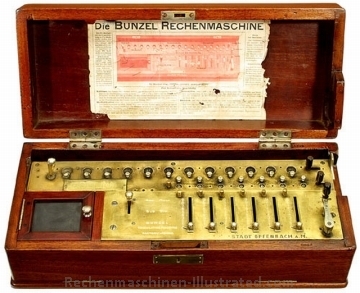 Since that time, a Bunzel-Delton calculating machine factory has been set up again (12 Klimschg., Vienna III/I), although there are no details available about their machine at this time." 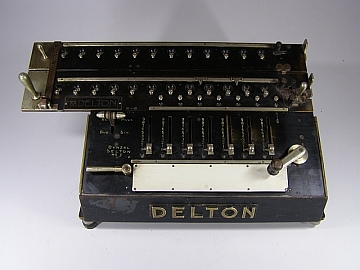 "This is a full-keyboard machine, manufactured only for English currency, by the British Calculators Ltd.. Belfast Rd, Stoke Newington, London N. The firm is no longer in existence." 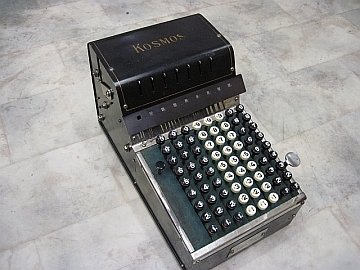 "This is a ten-key adding machine intended only for the addition of single columns of digits. In operation it is similar to the Adix. It was manufactured in London and sold for two guineas, although production has been stopped for some time now." 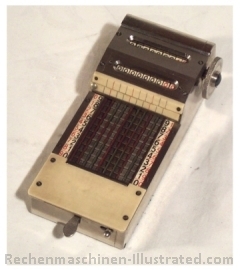 "This is a seven-place adding machine, similar to the machine of Michel Baum, although it does not equal it in quality. Manufacturer: Calculator Company. Grand Rapids, Mich."
Originally, the company was Bonham & Schram, Chicago, 1905. 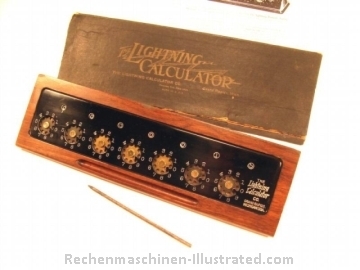 Bonham's patent did become the basis of the Lightning Calculator and the Pangborn adding machine..
production years 1905 - ??? production years 1908 - ??? 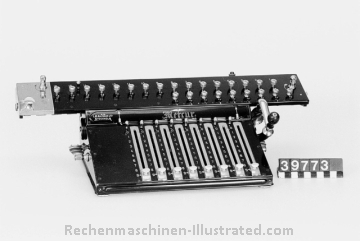 Small German adding machine with chain mechanism, manufacturer: Carl M. Behr und Co., Leipzig. Not mentioned in Martin. A description and drawings can be found in the Swiss patent. 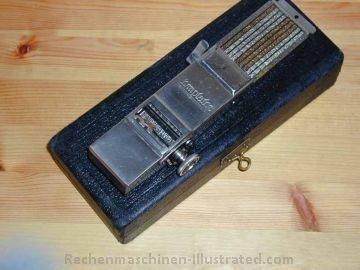 Originally manufactured by Schubert & Salzer, Maschinenfabrik, A. G . Chemnitz, Sa., since 1922 by Hans Sabielny, Dresden. Daemen - Schmid , Zürich (CH) sold the Comptator under their own label. 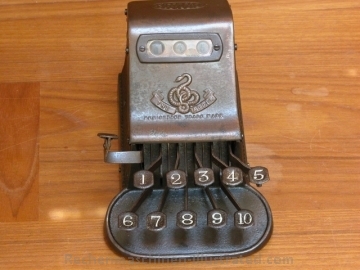 "This is a ten-key adding machine. The printing is hidden and can only be read if the carriage is raised. It has visible result viewing windows for nine digits and viewing windows below these from which it is possible to check the amount entered. Total, subtotal, repeat, and correction keys all lie above the numeral keys. The machine has never reached Europe and is no longer manufactured. 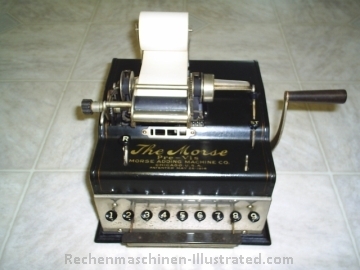 Manufacturer: Morse Adding Machine Company, Chicago." According to McCarthy "American Business Machines" start of manufacturing of this machine was 1913. "Manufactured by L. M. Ericson & Co.. Stockholm. Pinwheel machine with slide setting. The slides sit on the screw shaft. The carriage is above. The machine has sixteen places in the result mechanism and nine places in the revolution counter. It is no longer made."